A custom magnetic calendar is a cost-effective and convenient corporate gift. Show important dates and information about your brand at a glance! Just add your company name and artwork to one of our stick-on calendars, and customers will remember your business every day when passing their fridge, filing cabinet at work or gym locker. ePromos’ design team will work with you to capture your brand’s signature style. Give us a call at 877-377-6667 or chat with a representative online to start your order! Wish your family, friends or co-workers season greetings by presenting them with a logo greeting card and custom magnet all-in-one! Show your your team spirit and promote your brand with this team schedule custom magnet! Show off your creativity for an entire year with a 30 mil. BIC Promotional Magnetic Calendar! 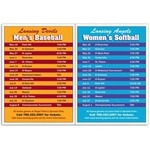 Show your your team spirit and promote your brand with this sports team schedule custom magnet! Show your your team spirit and promote your brand with this professional sports team schedule custom magnet! Magna-Stick Custom Calendar with durable vinyl coating. They'll keep your logo on their fridges and cabinets! Magna-Stick Custom Calendars are an ideal way to keep your contact information handy for clients and customers and features a 14-month calendar pad! This Magna-Stick Custom Calendar has durable vinyl coating. They'll keep your logo on their fridges and cabinets! Durable promo bookmark with magnetic backing to keep your page in place. Getting custom calendar magnets imprinted with your logo has never been easier. Browse our site for calendar options that will be a perfect fit for any business, organization, or event. Any magnetic calendar you choose – stick up calendars, peel-and-stick calendars and more -- will keep your business showcased throughout the year. You can choose calendars for the sportsman, old car fanatic or gear head. We also have all kinds of shapes including houses, footballs, hearts and more. Imagine the impact of giving away a promotional product that will serve as a reminder of your brand all 365 days of the year. Regardless of the type of business you conduct, giving away personalized magnetic calendars as a holiday gift will say “thank you”. Or, if you are launching a new product, opening a new location or planning a special event, give away a free calendar to attract potential customers. More marketing ideas for these essential business accessories: Save postage and send magnetic business card calendars along with a notecard to prospects in your community. This cost-effective marketing tool is great for realtors, insurance agents, home service companies and more. This perfect giveaway builds brand awareness and can easily be delivered for a successful direct mail marketing campaign. Promotional magnetic calendars are an incredible gift to customers, employees, prospects and more. You know you’ll get tons of brand exposure, since recipients will look at them every day. You can rely on ePromos for expert advice, top selection, best pricing, easy shopping and the job done right – guaranteed. Customize your order with your logo, messaging, or photo today!